Sorry for the weird swatch. This is kind of a long story, but this is my right hand which is my non-swatching hand. I had an idea for a manicure and video nail tutorial. I don’t always think things through sometimes, and I thought that I could film a nail tutorial on a manicure that I had never done before. I did my research and thought that the manicure would be easy so I set up everything to film. I filmed a good 7 or 8 minutes worth of footage, and realized that it wasn’t working. It didn’t work at all and I made a huge mess on my left hand. I was kind of upset that I wasted all that time, when I could have done a manicure to actually post. Then I realized that I had never featured this polish on its own before! So I busted out my camera and awkwardly took pictures of my right hand! Sephora By OPI “Whats A Tire Jack?” is that SBO’s signature black creme. Unfortunately, I don’t have that polish to compare it to this matte counterpart. I realize that matte finishes aren’t everyones cup of tea, but honestly I can’t understand why. They dry super quickly and you can always put a top coat on them to have the same effect as their glossy counterparts. I have a good handful of matte polishes in my collection, but this one holds a special place in my heart. I found this in the Clearance bin at Sephora and couldn’t believe anyone wouldn’t want this! This is just 1 coat! Just 1! No wonder it was my go to black for a few years. I stopped wearing it because the bottle is almost gone, but its still my first choice when I need an opaque dark base in just 1 coat. Dry time is super quick, just like all mattes and you can visually tell when its dry. I love this polish and I couldn’t believe that I never put a blog post up for this polish before! What are your thoughts on matte polishes? Do you guys like them or hate them? What are your favorite matte shades or favorite black? Wow, I like that. 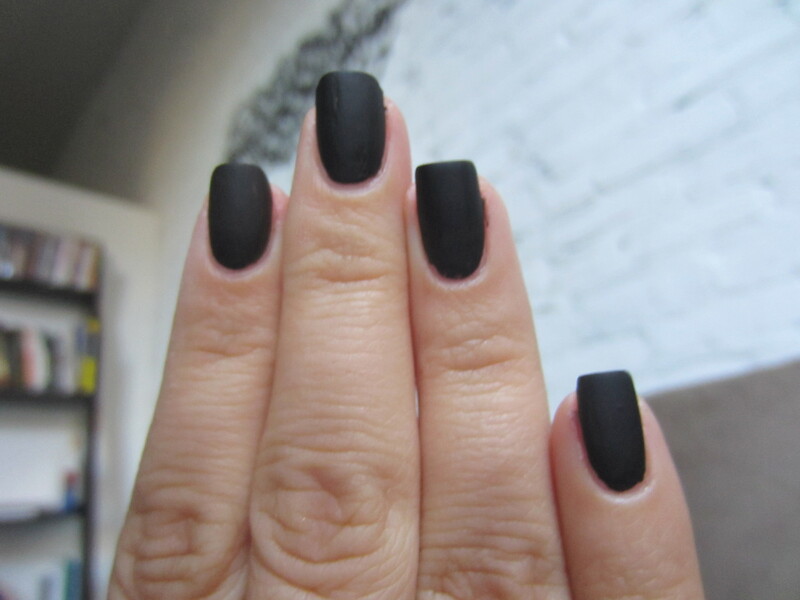 I have never tried a matte – I keep intending to. One of these days I’ll get around to it! try a matte top coat. i think elf makes a cheap one but i don’t know for sure. i know essie makes one but thats a little bit more pricey if you’re just looking for something to experiment with. zoya has a matte line that is still available too! i have zoyas verushka which is a matte dark green and that amazing polish.